This week’s comic marks the start of something new and very different for us. It’s something we have spent a couple of weeks working very hard on, and we are very excited about it. We hope you enjoyed what is just week one of the adventures of Panda. Those familiar with ‘Lost Patrol’ should have an idea of what he is in for next week – suffice to say things won’t get any better for him right away. More than ever, we would love your feedback. We have 4-6 weeks of comics planned in this style with our panda friend, so if you absolutely hate it, you’re probably just out of luck. Other than that, we hope you give it a chance, and would love to hear your thoughts. We had a lot of fun working on the series – developing the idea, setting up a little makeshift home studio, taking all the pictures, and then stitching them together in Photoshop. It’s a completely different approach to making comics for us, and we both felt it exercised our imaginations and talents in new ways. After three years (!) it’s good to take a break and try something different, and I think this story arc is the best the comic has been in a while. Also, if you do like the comic, it would be great to get some reposts/likes and all that other good social media stuff, to highlight the story. Much thanks if you can spare the time for that. Finally, of course, a mention must go to publishers Bombyx and Matagot for publishing Takenoko, which of course is where this week’s comic is set. Full credit to Antoine Bauza for designing such a great, adorable game. In fact, as Panda continues his adventures in the coming weeks, the games of Antoine Bauza will be cropping up again. And of course, the game owes its beautiful design and aesthetics to illustrators Nicolas Fructus, Joel Van Aerde & Yuio. It was a pleasure to spend so much time photographing their gorgeous game (I probably took about 80-100 pictures for the comic, and enjoyed it the whole time). If you have never played Takenoko, we strongly recommend it. It’s light, with a fair sprinkling of luck, but it is fun, beautiful, and just the right level of thinking for a gentle evening’s game with friends. And it has a panda. I mean, how could you not love that guy? 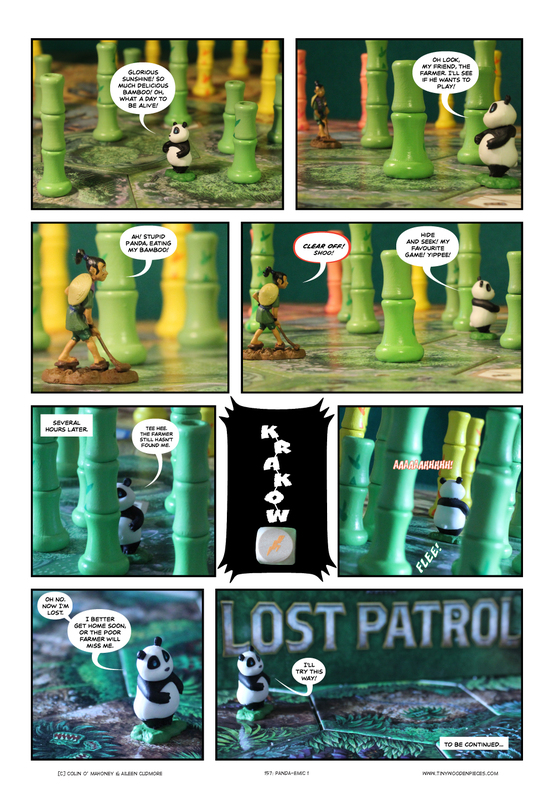 It is completely fair to say that the panda miniature in Takenoko is entirely responsible for the arc of our comic for at least the next month. I have several friends who like pandas (owing in part to their cuteness, and part to the fact that we were team China in a couple of MegaGames). I’ve never played Takenoko, though I keep meaning to. I’m pretty sure I have at least one friend who owns it. Thanks so much for the sharing, Emily! We really do appreciate that. We’ve never got to play a Megagame, very jealous of that. How did you find them? Takenoko is lovely, definitely give it a try if you can. I didn’t have to look, the first MegaGame came to me! A couple of friends bought the original Watch The Skys rules from the UK mob, got together a group of Mods (my BF included), pulled it apart and made their own game which I was happy to play in. Then we were of course hooked and went to Sydney to play in a pirate MegaGame run by a group that had come south to play in ours. And then a few months ago our group ran (after many months of writing) the sequel to last years first game. Now I’m just waiting for someone to make the next one. A pirate mega-game!!! Whaaaaat! That sounds like the best! By the way, are these figures original (and originally painted) from Takenoko? I hope we strike the right balance for you! And yes, the miniatures from Takenoko come painted, aren’t they gorgeous? I am totally looking forward to the panda’s adventures in gameland! lol! I also like that you’ve told us how long this will go so I know you’ll eventually go back to your drawn comics. I like mixing it up, but don’t know how I’d feel if you permanently went this way. Also, I like story arcs in online comics. Yay! Thanks Sarah! It’s a lot of fun thinking about into which games he might wander. So much potential! d’aw, thanks Rose! Nice of you to say, and lovely to hear.